SANTA ROSA, Calif. -- At least 10 people were killed and more than1,500 buildings destroyed as wildfires burned through northern and southern California on Monday. Two were seriously injured, fire officials said. More than 100 people have been reported missing in Sonoma County, officials there say. Vice President Mike Pence, in Los Angeles Monday night for fundraisers and local events, commented on the wildfires, saying he wanted "all of you in the path of these advancing wildfires" to know "that we are with you." "We also asked Congress to put more toward expenses -- it has been a challenging month and a half for natural disasters, for hurricanes affecting Texas, Florida, Puerto Rico -- but I want to assure California that we will be working closely with Gov. Brown to see you through these challenging times," Pence said. CBS News' Danielle Nottingham reported from the Coffee Park neighborhood, where not one house stood. One man named Tyler had returned to his house to find nothing salvageable. So far, he said, he couldn't find anything -- all he has left are the clothes on this back and his motorcycle. Officials were urging residents not to return yet, Nottingham reported, because some fires are re-igniting. Meanwhile, in southern California, where a fire burned through the Anaheim Hills neighborhood, a fast-moving fire pushed by 45 mph winds had already burned 2,500 acres, KNX field reporter Peter Demetriou said. Demetriou reported that the fires would come in and the embers pushed by the flames would "hopscotch." More than 1,000 homes were evacuated from the Anaheim Hills neighborhood. On Monday, Gov. Jerry Brown issued a state of emergency for Napa, Sonoma and Yuba counties due to the wildfires. The Atlas Peak fire was the largest, quickly growing to more than 8,000 acres near Napa. Meanwhile, authorities have expanded evacuations in Southern California's Orange County because of a fast-moving wildfire. 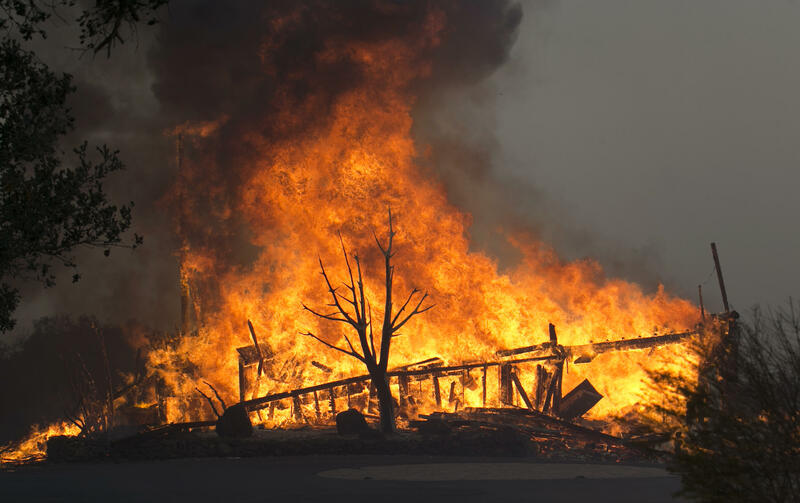 The fire that started on Tubbs Lane near Calistoga had grown to 35,000 acres and has spread into Sonoma County and parts of Santa Rosa, CBS San Franciso reported. Cal Fire said the Redwood Fire in Mendocino was at 4,500 acres, the Patrick Fire in Napa was at 100 acres and Nuns Fire in Sonoma County was at 300 acres. The fires had stretched Sonoma and Napa counties' firefighting resources to the breaking point. A call for mutual aid was issued to other Bay Area fire departments. California Highway Patrol officials said their Golden Gate Division Air Operations helicopter crews have rescued 42 people, ranging in age from 5 to 91 years old, in the various fires from late Sunday night to midday Monday, CBS San Francisco reported. The National Weather Service had issued a red flag warning for the Bay Area early Sunday, predicting gusty winds and dry conditions. Gusts were predicted to be in the 30 mph range in the area of the fires. The rapidly moving Atlas Peak fire was visible throughout Napa Valley, heavy smoke was draping over the region. Cal Fire said the blaze broke out at 9:50 p.m. Authorities said the flames moved quickly toward the Silverado Trail — an area dotted with homes and wineries. Officials said the Silverado Country Club — site of this week's PGA Tour tournament — was evacuated. Flames were also burning near the Domaine Carneros winery. Cal Fire Deputy Chief Scott McLean said there had been no containment of Atlas Peak fire overnight, with winds blowing at 28 mph and the humidity at just 12 percent. "Very, very volatile fire conditions," McLean said. The Napa Valley Register was reporting that authorities were going house to house just north of Silverado Resort urging residents to leave. The paper said there were reports of at least three structures burning on Atlas Peak. Napa officials said two evacuation centers had been opened — at the Crosswalk Community Church on First Street and at the Napa County Fairgrounds. In Calistoga, an evacuation center was opened at the Calistoga Fairgrounds. Officials with the California Governor's Office of Emergency Services said at a press conference that roughly 45,000 residents are currently without power in Napa and Sonoma counties. A large plume of smoke from the fire drifted as far south as San Francisco and the East Bay, where residents were reporting the strong smell of smoke in the air. The massive fire rekindled memories for longtime Napa Valley residents of the 1981 Atlas Peak wildfire. In that blaze, 23,000 acres were burned, $36 million was done in damage, 65 structures were destroyed and 11 people were injured.